As a New Yorker with a preference for cityscapes (all things black and white), mixed with street photography, I (@nyroamer) often find myself on the go, immersed in the hustle and bustle of the city. Sometimes my shooting is a planned endeavor, and I have all my photography gear readily available. Other times, my shooting is spontaneous and I am drawn to a particular moment, or struck by a scene, and I have only a moment to capture what I want, quickly. I’m also particularly drawn to the elements/inopportune weather that can be challenging to shoot in, be it rain, snow, or fog. Throughout any variable or situation that I’m in, my Sony Alpha cameras are the ideal everyday (and travel) powerhouses. They are lightweight, versatile, and capture great images. 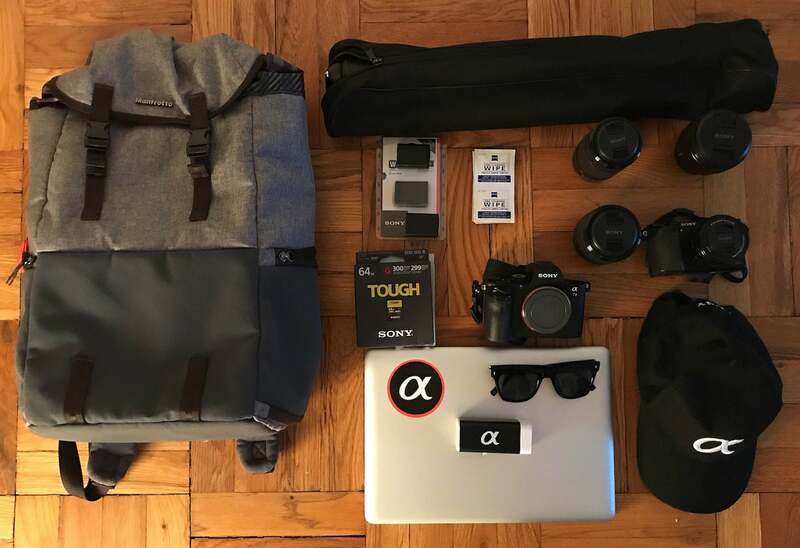 Here’s the complete kit of gear I carry with me to capture beautiful New York City in black and white. Sony α6000: This is what hooked me on Sony. I was in a store years ago, and played around with it, having no intention of buying a camera at that moment. I had used an older DSLR, which was heavy and bulky and found that it just wasn’t practical on an everyday basis. I was drawn to the α6000’s compactness and how lightweight it was. I bought it on the spot. Little did I know, this camera would travel around the world with me, become my go-to, everyday camera, and change my life. My α6000 has seen its share of battle wounds and scars, from the Sahara desert in Morocco, to a safari in Kruger National Park, to the Great Wall in China, icebergs in Alaska, and so much more. But, it has truly never failed me. In addition to it being so portable, it is a phenomenal introductory camera, and what I credit as not only driving my photography passion, but, introducing me to the Sony Alpha world. Absolute game changer. In a fast paced city like New York (truly the city that doesn’t sleep), the continuous shooting at 11 frames per second enables fast action shots that allow me to capture the hustle and bustle of it all. There have been many times I whipped out my α6000 quickly to snap a runner, a cyclist, a moving car, or a fleeting moment that I needed to snap quickly. At 24 megapixels, I have loved the crisp, clean images this camera produces, over a variety of lighting conditions (ISO 100-25,600) – perfect for travel and street photography in a city setting. Sony α7 II: I just got this camera and am already in love. Like the α6000, I love the practicality of it (compact and lightweight). While it’s a tad bulkier than my α6000, it easily fits into my work bag, making it perfect as an everyday camera. From a technical standpoint, the difference in transitioning to a full frame is quite incredible. The larger sensor gives better control on things like depth of field and given aperture. It’s a beast and perfect for street photography. I have utilized it in various lighting situations and snow, and was blown away at the crisp clarity of each shot. I can’t wait to make it the part of my life the α6000 has been! Sony 85mm f/1.8 (α7 II) - I am in love! I was looking for something different, to really challenge me photographically with the α7 II. This lens goes everywhere with me - small and light, perfect for being on the go in the hustle and bustle of New York. It enables me to capture intricately detailed images without getting too close to my subject, which is perfect when on the streets of New York. This lens is shoots incredibly clear images, with sharp bokeh effects. It has easily become my favorite! Sony 55-210mm f/4.5-6.5 (α6000) - Perfect as an entry level tele-photo lens for my travels and city shots, when I need distance. I’ve always been impressed by the lens' ability to render very fine details, from architectural fine points, to the rolling waters of Niagara falls (movement). The lens brings all those distant subjects closer, providing the extra reach you're looking for. 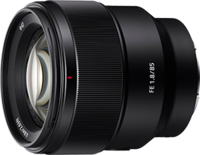 Sony 28-70mm f/3.5-5.6 (α7 II) - For me, this lens delivers excellent sharpness. It’s very light for a full-frame standard zoom lens. The length of the lens hardly changes as you zoom from 28mm to 70mm. Focus is fast, silent and accurate, which is ideal when you’re on the go. Memory Cards: You can’t ever have too many of these! My preferred memory card is the Sony TOUGH SD series 64GB card reading at up to 300MB/s and writing at up to 299MB/s. The other is a Sony SDXC UHS-II 64GB, reading at 260MB/s and writing at up to 100MB/s. Batteries: Self explanatory! I sometimes get so caught up in the moment when shooting, that I don’t realize I’ve nearly depleted my battery. You can’t ever have enough batteries! Lens Wipes: These are essential to me! When I’m out in the snow or rain, there’s nothing worse than droplets and smudges on my lenses. I carry them everywhere I go. Manfrotto Tripod: I don’t carry this on an everyday basis, but, if it’s a long exposure or specific shot I’m seeking, it’s essential. Manfrotto Camera Backpack: Lightweight and fits all my camera gear inside, as well as my laptop. I also love the compartments, that make it easy to retrieve what I need. Macbook Pro: Lightweight and easy to travel with. Admittedly, I edit on my phone, but, if I’m shooting a multitude of pics, I want to be sure to upload them as soon as I can. Hat/sunglasses: Blame my fair skin for burning easily, I’m always in a hat and sunglasses! Ashley Noel is a member of the Sony Alpha Imaging Collective. Follow all of their adventures on Instagram https://www.instagram.com/nyroamer/.